Health assessment is central to effective planning, implementation and evaluation of nursing care. All nurses are accountable for the care they provide and need to be able to accurately determine patient needs in order to plan and deliver evidence-based care. 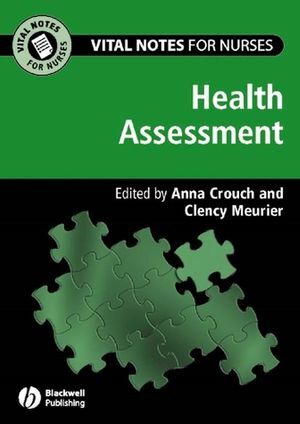 Vital notes for nurses: Health assessment provides students with the knowledge required to consider the many different factors which can influence patient’s health, comfort, well-being and recovery and to confidently assess patient needs. Vital notes for nurses: Health assessment explores concepts of holism, health and illness, factors to consider when assessing patients, communication skills needed for assessment, and all aspects of holistic assessment including physical, psychological, social, cultural and spiritual factors and nutritional needs. Anna Crouch and Clency Meurier are both Senior Lecturers at University of Northampton.